The congregation was pleased to welcome two visiting Progressive rabbis for Simchat Torah services this year. Rabbis Kinneret Shiryon from Modi’in in Israel and JoEllen Duckor from Wellington in New Zealand led a joyous service filled with enthusiastic singing and dancing with the Torahs. As the service was geared towards children, the atmosphere in the synagogue was imbued with youthful excitement and curiosity. After beginning with renditions of songs including Hevenu Shalom Aleichem and Kol Ha’Olam Kulo, the rabbis invited everyone onto the bimah to take a close look at the Torah scroll. The care and precision taken by sofrim (scribes) when writing scrolls was then explained. Attendees young and older then took turns dancing with the Torah in seven circuits around the shul accompanied by festive songs such as Hava Nagila. The shul has been honoured by a visit from the Governor of Tasmania, Her Excellency Professor the Honourable Kate Warner, AC. Accompanied by her husband Richard and an aide-de-camp, Professor Warner toured the shul for one hour on 20 June, 2018. The tour was led by Daniel Albert, one of a group of three volunteer guides who introduce visitors to the synagogue and its history throughout the year. The vice-regal party took particular interest in the precious historical objects on display in the shul. They marvelled at the ornate Victorian chandelier over the bimah as Daniel explained the various technologies used to generate light from it over the years. Daniel also shared his extensive knowledge of the Czechoslovak Torah scroll rescued from from the Nazis. Professor Warner and her husband were interested to learn more about Judaism and were given a general overview of Jewish practices and customs, along with an overview of the congregation and Australian Jewry. Some of the colourful personalities integral to the congregation’s history were discussed. Daniel explained the role of Judah Solomon, who first provided a venue for Jewish services in his home, Temple House, and then donated the land on which the synagogue was built. Isaac Friedman, the first Hungarian migrant to Australia, and Phineas Moss, who was a prominent 19th century science lecturer, were also covered. Tours of the synagogue can be organised for all members of the public on request, subject to the availability of guides and provided at least 48 hours’ notice is given. More information including a link to an online tour booking form can be found here. 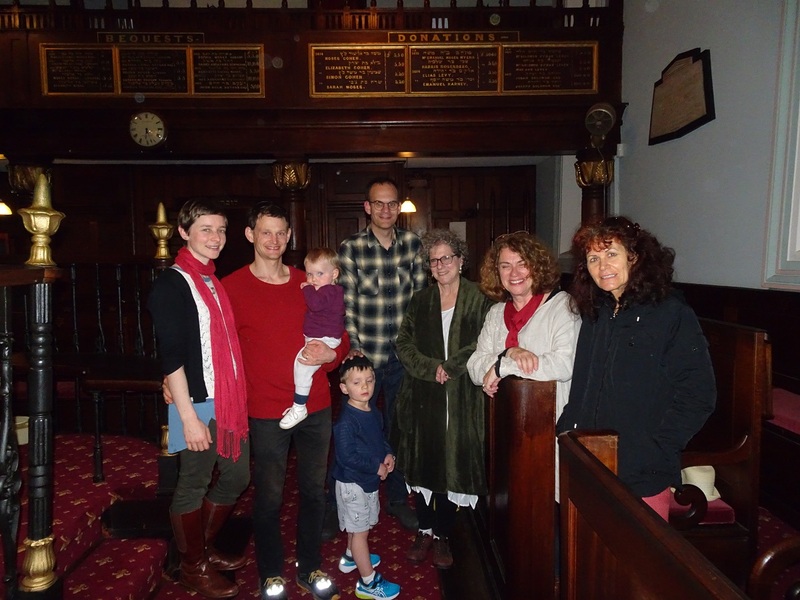 An issue of the Launceston Examiner earlier in 2018 carried an article on the history of Launceston’s synagogue, the second oldest still in use in Australia (with Hobart shul being the oldest). The article was published on May 13. It has the unfortunate and slightly misleading headline ‘Spiritual heart now quiet’, but otherwise traces the history of the synagogue from when it was first proposed in the early 1840s, with a focus on the early years. The controversy following Governor Franklin’s refusal of a land grant for the shul is covered, while illustrations accompanying the online version of the article show a range of photos and reports culled from the Examiner’s files. The online story including the illustrations can be viewed here. Anyone living in Launceston or the north of Tasmania who would like to belong to an inclusive Jewish community organisation is very welcome to apply to join the Hobart Hebrew Congregation. A Northern Coordinator has been appointed to represent the interests of the group of members living in the northern part of the state. More information on joining Hobart shul, including a link to the membership application form, is available on this page of the website. A digital library that chronicles the remarkable history of the Jewish community in Hobart has been posted by the congregation. The library includes more than 300 records, starting with an 1839 newspaper article detailing an early Yom Kippur service. Several items specifically relate to the history of the synagogue. The website hosting the library can be accessed here. It is meticulously organised, with researchers easily able to track down resources relating to a wide array of subjects. The material provides fascinating insights into some of the colourful personalities who have helped maintain an active Jewish presence in Tasmania despite the community’s small numbers. There is also an active blog that highlights particularly interesting themes. At its April 2018 meeting, the Board accepted with regret the resignations of the congregation’s President Jordana Schmidt and Treasurer Kalanit Mayer, and thanked them for their contributions. Both positions have been filled on a temporary basis until permanent replacements can be elected at the next Annual General Meeting later this year. The Board has also chosen a temporary replacement for the non-executive position that became vacant as a result of the other changes. Jordana had been President since August 2016, and a member of the Board since 2014. She resigned due to ongoing health issues. David Clark, the shul’s long-time Vice-President, was chosen by the Board to be Acting President in Jordana’s place, leaving the position of Vice-President vacant until the AGM. Kalanit submitted her resignation because of mounting work demands on her time. She was elected to the position at last year’s AGM in August, and had been Secretary the previous year. Jeff Schneider, a non-executive member of the Board since the 2017 AGM, has been appointed as Acting Treasurer. The vacancy for a non-executive member of the Board flowing from Jeff’s selection as Treasurer has been filled by Sean Ladiges. Although Sean, his wife Sarah Gelbart, and young daughter Netta haven’t been members of the congregation in their own right for very long, Sean is a familiar figure around the shul. He was brought up as a member of the community by his parents Michal and Sven, and celebrated his bar-mitzvah with us. You can find out more about the current members of the Board here. The Board of the congregation has reluctantly authorised a reduction in the number of Progressive services each month from three to two. From the first service in May this year, Progressive services will be held on the first Saturday and third Friday in each month. There will be no Progressive services on the second Shabbat of the month. This means that Erev Shabbat services followed by a shared supper will move from the second to the third Shabbat of each month, starting in May. Orthodox services are unaffected by this change in the service schedule, which has come about as a result both of falling attendances and the withdrawal of a Progressive lay service leader. The shul is in desperate need of more Progressive lay service leaders, and can provide training and support for the role. If you are interested, please email this address to register your willingness. Daniel Albert, the long-time former president of the shul, has been appointed to a new honorary position as the congregation’s first archivist. In the new role, he will be managing all materials relevant to the history of the shul and the Tasmanian Jewish community generally. These materials can include both documents and objects, whether they’re already in our possession or are donated in the future. Daniel will start by sorting out material that’s been stored and sometimes hidden away in various places around the synagogue building, but also has the task of responding to enquiries concerning the shul’s history that are generated from the synagogue’s website. He’s hoping that some of those enquiries will involve possible donations to the shul’s historical collection. Anyone who’s thinking of contributing materials of historical interest to the shul can reach Daniel by leaving a message here. Please include the words Archivist Contact in the subject line. “I’m interested in any old documents and other items of historical significance, not just about the congregation, but the Jewish community in Tasmania as well,” he says. Daniel served as President of the congregation for 10 years from 2006, and was a Board member both before and afterwards. There have been some major changes to Hobart Hebrew Congregation’s Board of Management after the 2017 Annual General Meeting of the congregation held on Sunday, August 27. Daniel Albert was President from 2006 to 2016 and an ordinary Board member both before and afterwards. Beginning in 1983, Stephen Graetzer served as the shul’s Treasurer for a total of 28 years in two separate terms. The AGM voted unanimously to thank Daniel and Stephen for their many years of tireless unpaid work on behalf of our community. Daniel commented later that when he started on the Board he was nominated without his knowledge and had no inkling he would stay on for so long. John Rosenbloom, who had been an ordinary Board member since 2014, also stepped down at the AGM. Stephen has been replaced as Treasurer by Kalanit Mayer, who had previously been the Secretary of the congregation and is a book-keeper in her day-job. The new Secretary of the congregation is Louise Knopman. Louise was formerly a professional social worker with users of Australian Sign Language, and has been a member of the shul for many years. She was on the Board for a period several years ago and is excited to be returning to it. The two vacancies for ordinary Board members have been filled by Lev Fridgant and Jeff Schneider. Lev lives in Launceston with his wife Maxine Glanger and works as a psychiatrist. He’s the first representative of our growing Northern Tasmanian membership to take a seat on the Board. Jeff is one of our younger members and together with his wife Lisa Eckstein is the proud parent of two young children. A professional web developer, he’s already made important contributions to the congregation’s well-being through setting up and administering the new shul website launched in October 2016. Continuing in their existing roles are Jordana Schmidt as President, David Clark as Vice-President, and Susan Steenbergen as an ordinary member. You can read more about Jordana and the make-up of the new Board here. Membership (or more officially, seat hire) fees for the next financial year starting in July 2018 have been decided. The latest Annual General Meeting of the congregation held on 27 August 2017 approved the new scale of fees, which represents the first increase in membership charges since 2015-16. The congregation’s President, Jordana Schmidt, explained to the AGM that the Board was seeking approval for next year’s membership fees in advance so that renewal notices could be sent out as soon as the new financial year began in July 2018. She said that the congregation relied on membership fees to fund a large part of its recurrent spending, and could not afford to delay issuing renewal notices. Jordana emphasised that even after the increases, costs of belonging to the shul compared more than favourably with the rates for mainland congregations, including those with similar memberships. As always, any member who feels unable to pay their seat hire fee in full during 2018-19 will be able to apply for all or part of the fee to be waived. If you’re Jewish, live in Tasmania, and are interested in becoming a member of our congregation, you can find out about the benefits of joining and how to do it here.